If you're an adrenaline junkie, you'll get the ultimate rush from any of these adventures. Each is an experience that will stay with you for years to come and likely leave you wanting more. It's billed as the world's highest bungee jump -- and it just may be the scariest too! Any adrenaline junkie is guaranteed a rush when leaping off the platform on the side of a building, particularly if it happens to be the Macau Tower. While plummeting downward you'll get an amazing view of the busy city below and the open water beyond. You'll be free-falling at extreme speeds for four- to five seconds, while eventually landing on an airbag that has been specially designed to break your fall. The sound vibrates through your body, as you float quietly in the water. It's the song of a humpback whale gliding through the water toward you. You can swim with whales – under highly regulated conditions – in the Sanctuary of the Marine Mammals in the Dominican Republic. The humpbacks migrate to the Silver Bank from December through mid-April with Conscious Breath Adventures taking adventurous travelers out to meet them. You can also swim with humpback whales in Vava'u, Tonga. These South Pacific whales migrate from feeding grounds in the Antarctic to the northern islands of Tonga each year. Whale Swim runs tours from early July to late October. Parkour is an athletic discipline that involves crossing an environment in the most efficient, and sometimes acrobatic, way possible. You'll have to set up your own trips, but the videos of ultra-free runner Ryan Doyle will inspire you to emulate his actions for adrenaline highs. He swings through doorways at Machu Picchu, flies through the air alongside Rome's Coliseum, and visits the Great Wall of China. Hop into the cockpit of a two-seater English Electric Lightning, a fighter plane that actually flies high enough that you can see the curvature of the earth. Or, better yet, experience air-to-air combat in the Hawker Hunter, which can do loops that will leave you fighting intense G-forces. These are just two of the experiences that will get your adrenaline flowing while visiting Thunder City in Cape Town, South Africa. If storms and tornadoes fascinate you, sign up for a storm-chasing tour. If you're a true adrenaline junkie, you'll find yourself in a van so close to a tornado that the wind is rushing around you. Choose a company that has a good safety record and has been offering professional tours for years however, as this is one adventure that you don't want to cut corners on. Storm Chasing has offered tours in Tornado Alley for more than a decade. Silver Linings offers a variety of outings, from "On Call" storms to Storm Photo Tours. Excursions are offered roughly from May through August depending on weather conditions of course. Salt Lake City hosted the 2002 Winter Olympic Games and today, you can still get an adrenaline rush while zooming down the bobsled run in the Olympic Park, located in nearby Park City. During the wild ride, you'll rip through 15 turns, go downhill at almost 80 miles-per-hour, and experience up to 5 G's of force. Rides are available in both the summer and winter. For details visit Olympic Park Bobsled. For a true underwater adventure unlike any other, leave the oceans behind and go scuba diving in a cenote on the Mexican Riviera instead. You'll drop into a limestone cave carved out by passing water centuries before. As you swim through this strange and intriguing underworld, you'll witness a place that few have the opportunity to see, providing an experience that most divers can only dream of. Don't believe us? Here's what it's like to take a plunge in a cenote. Canyoneering is an outdoor activity that sends travelers into narrow, twisty canyons that require rappelling, swimming, hiking, and climbing to pass through. There are few places better to try this spot than in Moab, Utah, where there are plenty of opportunities to drop into sandstone gorges to explore hidden realms. If you're an adrenaline junkie, be prepared to spend days hiking and rappelling in these slot canyons. Exploration is part of the fun, as you wander through remote areas that few people ever see. The narrow trail that carries visitors down to Kalaupapa on the island of Moloka'i, Hawaii, is a single-file affair at best. As you drop down the side of the 1800-foot cliff, you'll be glad you're on the back of a sure-footed mule who can do most of the work for you. The adrenaline rush comes when you peer over the edge to see the ocean so far below, but the real pay off comes when you arrive at the former leper colony for a tour and some outstanding views of the spectacular beach and surrounding countryside. Surfing down the side of a volcano on a wood plank isn't the same as surfing in the ocean. Expect to get dirty, and maybe even pick up a few abrasions if you fall off the board. But those who've done it say it's a true adrenaline rush, blending speed, skill, and the lure of potential injury. 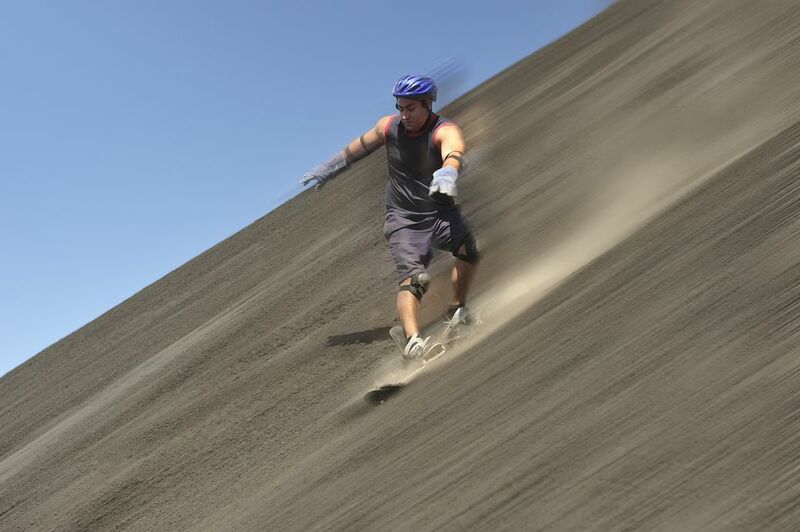 Learn more about this sport, which is sometimes called "ash boarding" at Bigfoot Boarding in Nicaragua. If you have the courage to jump out of an airplane flying 30,000-feet above the earth, HALO (High-Altitude, Low-Opening) skydiving just might be for you. Before you ever step foot in a plane, you'll need to learn the basics of skydiving and get set-up for a tandem fall. At this altitude, you'll get quite a rush, with the oxygen so thin you'll probably need to wear a mask. Go to Incredible Adventures for the details about this extreme experience that will almost certainly get your heart pumping. The movie Jaws comes quickly to mind when cage diving to see Great White sharks. Your adrenaline will definitely starts flowing as you see those teeth gliding through the water in your direction. The most well-known cage diving operations are off the coast of South Africa, and anyone in the Cape Town area can easily do this as a day trip. Contact Shark Cage Diving for details. Closer to the U.S., at various times of the year you can submerge in the waters off the Farallon Islands, 26 miles west of San Francisco, or take a multi-day adventure to Isla Guadalupe, located 160 miles off the coast of Baja California with Great White Adventures.